Beaducation: The Blog: Beaducation & Craftsy -- better together. GIVEAWAY! Beaducation & Craftsy -- better together. GIVEAWAY! Hey everybody, Lisa here. Have you heard the news? In addition to running the show here at Beaducation, I am also teaching an online class at Craftsy on one of my favorite topics: Make Your Own Wirework Findings. Click the link or image to watch a class preview. To celebrate, we are hosting a giveaway!! 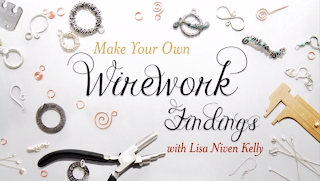 My class features six lessons that will teach you everything from wirework fundamentals like basic loops and spirals to creating your own jump rings and coils. When you're ready to advance, I'll walk you through each technique for making head pins, ear wires, clasps and toggles. The final lesson teaches you different oxidation techniques to highlight the details of your findings and polish your components. With a run time of four hours, you will learn so much and bring even more personalization to your jewelry. Just like the online classes at Beaducation.com, Craftsy classes never expire so you can watch each lesson as many times as you need to until you perfect your technique. Watch whenever you want! Leave a comment here on this blog post, letting us know your favorite finding. Head over to my personal blog to see pictures of my days shooting at Craftsy and leave a comment there. Follow me on Twitter! I'm new to the Twittersphere and don't have many followers yet. Our winner will be chosen on Monday February 18 at 10 AM PST. Be sure to tell your friends! I'm just starting to explore wirework and would LOVE to win! Can't wait to see the new book!! Congratulations!! Always wanting to learn other ways to form wire. Wow... only one? I love clasps and would be thrilled to know how to design and create my own. I'd LOVE to win this class with you! You guys always do such awesome giveaways! I'm in love with wirework, and this would be perfect for my collection! I'm into making my own bead charms at the moment thanks to your video, so I like headpins! I love fancy toggles! They are my favorite finding. Thanks for the opportunity. Need new ideas for clasps, and love to make my own jump rings! I love working with wire. I love making my own findings, but am just learning. I do love making my own earrings. I want to learn more about making my own clasps. Thank you for sharing your talent. I love toggles, especially your Tornado Toggle which I've made several times. wonderful giveaway, would be so much fun to make more of my own findings, I already make some, but am always wanting to learn more. My favourite finding is wire because it's so easy to make other findings from it - headpins, jump rings, clasps... the list goes on and on! I love clasps - they often are my design inspiration. I would love to learn to make more and would really love to win this give away! Ohhhhhhh, waht an exciting give-away! My favorite finding is balled head pins. Done, done and done! Thank you for your amazing products and thank you for the giveaway! My favorite findings are ear wires. And my favorite jewelry making supplier is Beaducation! Nice Giveaway! My favorite finding is toggle clasps. Just starting out, would love to take this class!! I LOVE Craftsy and am so excited that you have a class with them! I would love to learn to make toggles. Hard to live with out jump rings in all shapes and sizes! Making your own clasps and links are a great thing to know how to do and always fun to learn new styles. Making clasps, links and wire beads are my favorite findings. I already have Lisa's new class at Craftsy on my wish list there since I've taken a few classes at Craftsy. Would love to win! Getting back to my first love of jewelry making after having my 2 kiddos! Thanks for the great store and online classes and for all the giveaways! Love Beaducation!!!! What an awesome package! I'd love to win this class! My favorite findings are ear wires - they just make an earring something so special. Would love to win a seat in the class. Thank you for the chance. I enjoy making my own earwires and would love to experiment more with making my own findings. I have taken Craftsy classes before and they're awesome! I use a lot of jump rings in my work so they would have to be my favorite, but I've just started trying to make my own clasps. Would love to learn how to make them better! I love to make earrings and would love to make my own ear wires! thanks for having a great giveaway! Would love to see and learn more earring findings - my very favorite finding. I would have to say ear wires. I love to make my owb, so the size, style, and material match the earrings exactly. Those Wrat and Taps would be great for ear wires! You just never know when you will learn something NEW! Thanks for the chance for a free webinar and lovely gift! I love fusing fine sterling silver rings -- for jump rings, to hammer into earring findings....love them all! I would love to make convertible bales that could be moved from one necklace to another. I just started doing making jewelry and I would make my own findings! My favorite findings are decorative clasps. I would love to learn how to make my own! Handmade clasps are my favorite! Would love to learn a new technique! I was, just moments ago, looking at this class on Craftsy. I have taken a few other jewelry classes there and they were fantastic! I hope I win. My fave finding is unique handmade toggle closures that incorporate "found" items you normally wouldn't think of to use as a closure for a necklace or bracelet. Anything Steampunk makes my heart flutter! I would love to learn to make clasps and perfect different techniques! I am such a huge fan of all things Beaducation!!! Thank you, for the opportunity to win this great prize - but mostly, thank you for the great inspiration, products and customer service. I was missing something from an order that I had placed. I emailed CS, and asked about it. The rep could not have been nicer, and the item was in my mailbox two days later. How amazing is that?! Love, love, love!!!! Fav finding has got to be earwires, and I'd love to win a class to learn more! Fave finding would have to be jump rings. Different sizes, shapes...plus you can make chain maille! Love Beaducation and love Craftsy! What a great pairing. A finding I regularly make would be ear wires. I love that they don't look "typical". It's a great way to jazz up something simple. My favorite finding is jump rings! You can create so many things with them and they are they links between other fun jewelry items! i love split rings... maybe that sounds crazy but they are like a spirograph of wire possibility to me. So excited for the opportunity to possibility of winning a class - I'm so new to jewelry making that I'm not sure what my favorite finding is yet! My favorite finding has got to be the connector because of its many uses. I love it when "work" is fun! I really like fold over clasps for bracelets and the are pretty hard to find without the magnets any more, other than that I love toggles! I would love to learn it all, but if I have to pick just one , clasps all kinds! I love all of the classes offered on Beaducation. It's really helpful to be able to watch whenever and as often as necessary to learn the technique. This is a terrific giveaway! Making my own clasps allows the whole piece to be of my own creation. Improving that skill would be awesome. Lisa, you are one busy and talented lady! I love magnetic clasps for bracelets - easy to put on and hard to lose the bracelet! May wish would be to learn to make the lovely variety of wire clasps. Thanks for the opportunity to win these great prizes. Love her work! I really love toggles because they're so versatile and can become focal pieces depending on what you're making. I've never made my own though! I love to use ear wires that are secure on your ear. I'm always wondering how to make unique ear wires. My favorite finding is the 'S' clasp. It is the first clasp I learned. Clasps are such an important part of any type of bead design. So many times a bracelet turns itself around and the clasp becomes the main focus of attention. Being able to make your own clasp, and call it your own, is the ultimate in creating a unique, one of a kind design. clasps are one of my favorites, as they can be very original, and add a finishing touch. Lisa, I love your classes and the chainmail classes. My favorite finding is bracelet clasps. I would love to learn to make more custom ear wires! I couldn't do much without a wide variety of jump rings! I would love to win to learn more about wirework. Hi Lisa! I would love to learn more wire work skills - can never learn too many! Practice makes perfect, so they say, right? My favorite finding - probably toggle clasps (or is it earwires) - tough decision! I go through so many jump rings. It would be awesome to make my own. I look forward to seeing the range of possibilities! I really need one of those wrap and tap thingies! I would love to be able to cut my own jump rings and make my own clasps. Handmade, homemade findings are so much more beautiful. I especially love a handmade toggle clasp! I absolutely love the online classes. I have done some at Beaducation and also several at Craftsy. I either just flat can't remember things or I have too much in my head, but it helps incredibly to be able to go back and watch something numerous times. I just love learning new things, I think it does keep your mind sharp...even if it is hard to remember. And, the proper tools to use are always a big help! I would love to win the giveaway. Great sounding class! Beaducation Rocks! Wow, wirework, I simply adore it and this class would be a great opportunity to improve myself! My favorite findings are wire sculptured toggles, just amazing! Thank you for inspiring us, Lisa! I'd love to win. I'm starting to work with mixed metals/cold connections and these finding would look great! Thanks. My favorite finding is the toggle. I am enjoying all the varIous materials that you can use to design them with and it has been fun trying to think up more. My fav findings are handmade artisan clasps. They add a polish to a piece. Thanks for the giveaway! My favorite finding is jump rings. So versatile, you can do chainmaille designs, etc.!! I'd love to learn how to make my own necklace clasps. Thanks for the opportunity! My most used findings are toggle clasps and ear wires. Making my own would be fun! I love different kinds of clasps and balled head pins of all kinds. Always wanting to learn more! I love jump rings I am addicted to them. you can make so much stuff with jump rings. I use 5-6mm open jumprings all the time, so I guess they're my favorite (even though they don't seem like much fun!). I love making my own earwires. That way I can make unique earwires, different than what you can find in the store. I L.O.V.E. experimenting with new ear wire designs! Just left a comment on your blog. Looks like you had fun. Just started following you on twitter. My favorite finding would be a headpin! I left a comment personal blog. Fun!! What a Happy Valentine's treat! I am really interested in coiled bracelets and earrings. I would love to learn more techniques! Thank you! I make alot of earrings and would love to learn how to make my own ear wires. Sounds like the perfect give-away for that. I'm new to wirework and previewed the class on Craftsy. Would love to learn more about jump rings and ear wires - especially since mine aren't always round! Looks like you had a blast during this process. Love to be a student in your on-line class. I've been having fun making my own ear wires recently, but would LOVE to see what a pro could show me! Happy St. Valentine's Day to everyone! Ear wires are my favorite finding. I love making all different styles. Knowledge! Technique! Tools! Raw material! Hot dawg, let me at 'em! I'd love to make toggle clasps, ear wires, etc. Even just my own jump rings! Great giveaway! Wish me luck!!! I love the findings at dimestore emporium....really cool stampings that i use for everything! My favorite findings are hooks & bars! I love everything Lisa does but I would love to learn to make decorative clasps. There are so few available and they cost SO much! LOVE seeing other creative workspaces, it gives a real artisan feel. Thanks for sharing! My favorite finding, hum??? I HEART jumprings!!! Thanks for a chance! Clasps! Would love to learn how to make my own. Clasps are my favorite finding; making them would be so much fun. I just started working with wire and am already getting hooked! Great giveaway. I love yall's store, blog, classes, etc. I really love bails, they can be a big feature on how a pendant looks on a necklace. Great competition, would be so happy to win! My favorite finding has to be, hands down, fancy handmade ear wires! I usually use store-bought clasps. I really want to learn how to make my own clasps. It will be easier to customize to match my settings. I am becoming addicted to creating with wire. And I am new to Beaducation and so far I love it! I love the possibilities that wire has to offer. I would love to be able be chosen to take a class to expand on more ways to make wire creations. I hope this follows the rules - because Beaducation seriously has too many of my favorites to list. I would have to say my favorite finding are the metal stamps. The whole category! If forced to choose, I'd pick the birdhouse stamps. Or maybe the crown stamps. Then again, I love the robot. ARGH! There is no way I could choose...which is why a good part of each paycheck goes to acquiring stamps. Or metal. Oh boy. Don't get me started on the metal. Or the tools you guys carry. If you want to stick to true findings, I would go with the hex nuts you guys carry. LOVE THOSE! Thanks for making me add another 150 items to my "Need or Die" list. lol Thank you for the fun giveaway! I really love toggles, and would love to make my own. my favorite finding is the sterling mini ribbon charm and puffy heart ... love making them for myself, my family, and the other wives in my husband's unit. looking forward to seeing how your class goes! very nice! My favorite finding is a crimp cover! I think they add a finished look to a piece, rather than leaving a crimp bare naked! Great giveaway Lisa. My favorite finding is making the swan type clasp. No two ever look the sae. I think my favorite findings are clasps. I love how the right claps can just top off the perfect design. I'm "ok" at making hook and eye clasps, but I would love to perfect them, and to add some toggles to my repertoire, so to speak. Thanks for the chance to win a spot in the class!! Love toggles to use in the front of a necklace as a focal point with beads hanging from it. Looking forward to making some of my own. I love clasps and hope to win to learn to make them better. Thanks for the opportunity! I would like to learn more about making clasps. I like earwires. I'm new to wire findings and find the variety of earwires fascinating. Great giveaway! I've not tried much wire work, so this is exciting! I have been wanting to perfect your toggle clasp. Learning from the master would be good. lol Trying to do it on my own was a hoot. My favorite finding I would have to say are rivets. I love hand made clasps and toggles! Need to learn to make them myself! Favorite finding?! So many choices, so little time! Probably all sorts of earring wires, there are so many possibilities! Just getting into jewellery making and would love to learn more. It would be the perfect prize! I would love how to make my on hook and clasp heart shape. Thanks for a chance to inter. A new hobby would be fun!!! I love pinch bails and jump ring chain maille. I would also love to learn how to make my own clasps and spacers. I'm a fan of the pinch bails and locking rings! Great giveaway. I want to do more wire work, so this is a great opportunity. Clasps are my favorite finding. Thanks for the chance to win such awesome tools! I'm new to jewelry making so I can use all the help (classes) I can get! I love bails and how detailed and intricate some are! It's great to learn more wireworking skills! TOOLS!!! I need that tool and I love taking your classes. Thanks for giving us a chance to win, yet another great giveaway. I love toggles and would like to know how to create my own. I am beginning to work with wire and am excited by the options wire opens up. Favorite finding would be twisted jump rings, for the moment! I would love to make many different wire findings - I have never made any of my own, and I'meexcited to learn how!! Something you don't carry and I'm having a hard time finding (no pun intended). It's called a spring gate ring or a gate ring. Used to attach charms or to make things easily interchangeable. Great to have this online class. Hope to win, thanks for the chance. My favorite finding are crimp covers. I think the most versatile finding are ball head pins in sterling silver. I love sterling silver and love putting mixes of beads, stones and pearls on these headpins to decorate necklaces, bracelets and earrings. I LOVE that you are offering more online classes all the time!! I like finding new ideas for toggles and clasps.... my favourites! I've been researching and wanting to learn wireworks! I haven't started yet. But I really want to! I do metal stamping for fun but I think this would be fun to learn also! I like toggles. There are so many great designs for them. I love wire links and connectors because they are so versatile. I would be thrilled to win a seat in your course!!! Thank You for the info.! I love learning new &/or better ways to make ANY kind of jewelry! My favorite finding to use are spacers. They add SO MUCH to a design., taking it from o.k. to awesome! I'm looking forward to your Wirework Findings class! I like making ear wires, but I want to explore clasps as well. Following you on Twitter too. Clasps, earwires, headpins...and I only get to choose one?? It's like choosing between your children, I love all of them! I would love to make my own. Beaducation and Craftsy together should be great, but when it includes a cool artist I am familiar with, it's a match made in heaven! Love beaducation - tools, classes, etc. Have also taken a couple on craftsy and found them to be excellent also. I'd have to say my favorite tool is a chain nose plier, but I would love to master the wrap and tap. I know nothing about wirework but it's been on my list of must try's! Welcome and thank you for allowing mr to try something new. I love working with various metal wires and making new shapes out of them. I love ball headpins and I really want to learn how to make them! Anything beautiful and easy. Pinch clasps for leather cord. Clasps are a favorite. I would like to learn to make my own. I would enjoy winning this give away! The S clasp has to be my favorite as it's so versatile! Thanks for offering this opportunity to win one of your online classes. I've learned so much from you over the years from magazines and online. Your generosity in sharing your expertise is much appreciated! How awesome!! I am just getting into wire work and have enjoyed learning ear wires, but would love to make clasps! My favorite finding is a decorative headpin for riveting mixed metals. I love wire work and would love to win this.